Hydroponics for Outdoor Growing . . . Growing orchids outdoors with our hydroponic system produces excellent results - but the system needs to be set up properly . Growing outdoors with hydroponics is different from indoor growing. because there's no control over how much water the system will collect in rainy weather. Too much water and the plants will suffer, even growing in LECA pebbles. Setting up orchids for outdoor growing is easy. 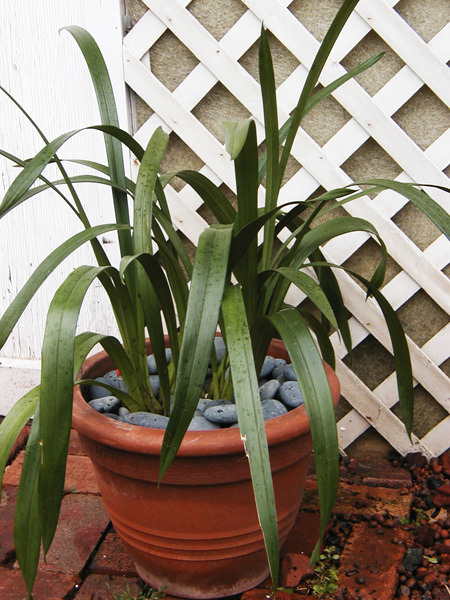 All you have to do is incorporate a drainage system so plants won't be overwatered. This is handy even if your plants aren't exposed to rain because you'll even be able to water with a garden hose. Setting up a drainage system simply means replacing the outer pot with a shallow saucer that will overflow when the desired water level is reached. Then, set the plant, culture pot, and saucer into a sturdy outer pot that will keep everything stable in all kinds of weather. Any type outer pot that has a drainage hole will work. I like displaying my plants in terra cotta (clay) pots because their weight anchors the plant and keeps it from blowing over in the wind. 1. Remove plant and culture pot from existing outer pot. Place in a clear plastic saucer which will be the new reservoir that holds the nutrient solution for the plant. 2. The plastic saucer needs to be cut down to keep it from collecting too much water. Using a scissors, trim the saucer to so it's only about 1/2" deep (the same depth as watering to "opt" on gauge). 3. After trimming the saucer, drop it into the clay pot. .4. Position plant, culture pot, and water gauge inside clay pot. 5. Setup is complete for outside growing. It's that simple! Culture pot, plastic saucer, and water gauge are the new "grow system" for the plant. The clay pot simply holds everything in place. The saucer under culture pot will capture just enough water for the plant - excess will overflow and drain away through the hole in the bottom of the outer pot. I like to keep everything inside the clay pot visible because judging water requirements is easier when you can see what's going on at the bottom. But, if you prefer a more finished appearance simply fill the gap between the culture pot and clay pot with more pebbles. Fill clay pot with more LECA pebbles for a more finished look. If you have a lot of orchids, setting them up in individual pots can be tedious and time consumming (expensive too!). No problem - our Grower Trays are perfect for outdoor growing too. Because a single tray can hold several plants. Heavy Duty Grower Trays hold several plants. Their rugged construction makes them ideal for outdoor growing. Drill a hole in tray to allow excess water to drain away. Drainage hole should be about 1/2" from bottom of tray. Remove plant(s) from outer pot(s). Place plant (and culture pot) in the Grower Tray - which will act as the resevoir. No need for a water gauge because you can see water level. As you can see, a single Grower Tray holds several plants. Water gauges are not necessary because you can see the water level at all times. Grower Tip: The trays hold a lot of water so be sure to allow enough time for the trays to dry out completely between waterings. I even let the tray sit completely dry for several days between waterings so the roots get the air they need to grow. If your orchids are standing in water for a week or more, force a "dry period". Remove the plants from the tray and pour out all the water. Don't rewater for 2-3 days. No matter what your skill level is, you'll be growing like a pro outdoors with our system!